Adjust to cover neck, mouth and ears, this scarf uses two kinds of fabric: soft surface made with polar fleece and inside attached thickened fur fleece to keep warm. Both sides can be used. Made from polar fleece fabric, very soft and warm. Thick and soft, sweat absorbent and windproof. Super elastic, suit for unisex grown ups. Adjustable string, can be used as neck scarf, hat or snood. A great accessory for cold seasons. 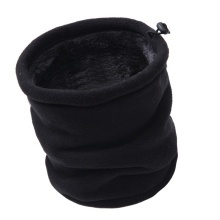 Suitable for daily scarf, winter neck warmer and balaclava for outdoor sports.